Shares of Apple stock jump to record high as Apple store projects U.S. shipments to take two weeks and international orders will take longer. iPhone 5 is shown during a news conference in San Francisco on Sept. 12, 2012. Apple Inc shares jumped on Friday, touching a record high on what one analyst called “iPhone 5 fever” as the company said some customers must wait two to three weeks for the new, slimmer, faster smartphone that accounts for half its revenue. Apple’s U.S. store, at www.apple.com, was projecting shipments for the iPhone 5 would take two weeks to fulfill, with analysts saying the date slipped within an hour of the start of presales. The company’s website showed buyers in United Kingdom, France and Germany would have to wait as much as three weeks to receive orders when the iPhone 5 starts shipping next Friday, the first day of deliveries. AT&T Inc, Verizon Communications Inc and Sprint Nextel Corp — the three US carriers who will sell the iPhone 5 — showed delays ranging from a week to a month by Friday afternoon. Apple did not give any further details on the demand. A Verizon spokeswoman said the company has seen “significant volumes” since it started accept pre-orders. AT&T and Sprint did not return messages for comment. The new model would also be available in Apple’s stores next Friday for walk-in purchase. Retailers like Wal-Mart Stores Inc and Best Buy Co are also taking preorders. “Clearly, iPhone 5 fever is in full swing,” Topeka Capital Markets analyst Brian White said. Apple shares closed up 1.2 percent at $691.28 on the Nasdaq. The shares earlier touched an all-time high of $696.98. Apple began taking orders for the iPhone 5 at midnight Pacific Time (0700 GMT) on Friday, with shipments set to begin on Sept 21. The smartphone is being rolled out in phases and will be sold in 100 countries by the end of the year. 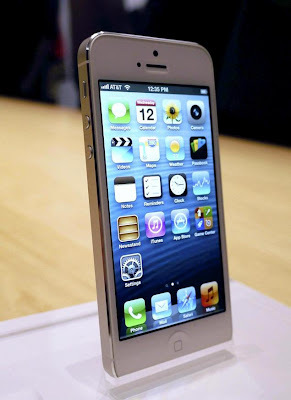 The iPhone 5 sports a 4-inch “retina” display, supports the high-speed 4G LTE wireless network, and is 20 percent lighter than the previous iPhone 4S. It is not unusual for Apple products to sell out the first day. Orders for the previous iPhone 4S, the last product the company introduced before the death of co-founder Steve Jobs, surpassed 1 million in the first 24 hours, beating Apple’s previous one-day record of 600,000 sales for the iPhone 4. Analysts have expressed surprise at how quickly Apple planned to roll out the new model around the world, saying this was the fastest rollout of the phone since it launched in 2007. On average, Wall Street analysts forecast Apple may sell well over 42 million units this year. But some analysts said the early sell-out may also point to a potential supply crunch. “We believe the fast sell out indicates both high levels of demand and constrained supply,” said Shannon Cross, analyst with Cross Research, an independent research house. “However, given that the company announced an aggressive rollout schedule, we assume management’s plan includes a rapid increase in production,” Cross said. One of Apple’s key suppliers for screens, Sharp Corp , is struggling with high costs and scrambling to raise funds to pay debt. Sharp, a Japanese company that is negotiating a deal to sell a big stake in itself to Taiwan’s Hon Hai, also Apple’s largest contract manufacturer, has fallen behind schedule on production of screens for Apple’s latest iPhone, a source had told Reuters in late August. The source, who is familiar with Sharp’s production operations, did not say how far behind the output had fallen. thanks for sharing this article, your article is amazing but font is too small, i have a problem when i read article on your site. so please change this font.